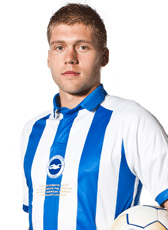 Roland Bergkamp joined Championship club Brighton and Hove Albion in July 2011 on a 2-year contract. The Holland U21 striker impressed in the 2010-11 season for Excelsior Rotterdam in the Eredivisie and attracted many clubs before signing a contract abroad. In November 2011 Brighton and Hove Albion centre forward Roland Bergkamp has joined Rochdale on an emergency loan until January 2, 2012. When his loan period expired he returned to Brighton. In summer 2012 he returned home. Bergkamp signed a one year loan contract for the 2012-13 season at VVV Venlo. In June 2013 he returned to Brighton where his contract expired. Bergkamp signed for FC Emmen a one-year contract as a free agent. He extended his contract in summer 2014 for another season. Bergkamp moved to Sparta Rotterdam on a 2-year deal until 2017 when his contract expired. He is currently under contract at RKC Waalwijk.